I think we all can agree that sometimes it’s nice to dig our teeth into a good burger, especially if it’s served with a side of delicious, crispy French fries. Thankfully, being vegan doesn’t mean forever depriving yourself of this simple pleasure: there are more vegan burger recipes on the internet than my fingers could ever count (I’ve shared my recipes for Black Bean Tempeh and Sweet Potato Chickpea burgers here before). For those of us who don’t feel like experimenting in the kitchen, a lot of grocery stores offer veggie patties – I’m not a huge fan of those, but they’ll do in a pinch, as long as you’re not turned off by the ingredients list. But sometimes, the craving for a nice burger hits when it’s too late to run to the store or start making veggie patties from scratch. The solution is easy – use Portobello mushrooms! The first time I tried a Portobello sandwich, I was shocked by how delicious it tasted, and how light and undisturbed my finicky stomach felt after eating it. If it’s tasty, easy to prepare, and not making me feel like I’ve swallowed a brick – what’s not to love? However, in the days before we moved from Alabama to Washington state, we had a grill that we used whenever we felt like grilling some vegetables (and other things before going vegan). It was too complicated to pack it for a cross-country move, so we left it to our neighbors. So far, we’ve found little need for a grill at our new place, which is just fine until a craving for a Portobello sandwich hits. I quickly realized that I needed to find a way to cook Portobellos on the stovetop. After some experimenting, today’s recipe was born! For this sandwich, I marinate the mushroom caps in barbecue sauce, and then smear even more sauce on the mushrooms right before serving. I cook the caps in a little bit of an improvised broth to infuse them with some more flavor – some dried rosemary helps with that. Also, there’s no need for adding oil to the pan as the rosemary broth keeps the mushrooms from sticking. My love for rosemary goes beyond the mushrooms – I like to sprinkle it on potato wedges before roasting to infuse them with an unbelievably delicious flavor and aroma that fills up my house every time I make my Roasted Rosemary Fries. I know that every food blog out there already has a recipe for roasted French fries, but I just had to share my favorite way of cooking them. Use just a bit of cooking spray in case you’re watching your oil intake. These sandwiches pack a lot of flavor thanks to marinating the mushroom caps in barbecue sauce and cooking them in a rosemary-infused broth. Portobello mushrooms make for a lighter patty option than most veggie burgers. Pair these with the roasted rosemary fries for a full comfort food experience! Clean the tops of Portobello mushrooms with a damp paper towel (this works better than washing because mushroom gills can soak in too much water). Cut off the stems and save them for later use. Spread about 1 1/2 Tbsp of barbecue sauce over the top and the bottom of each mushroom cap. Set aside for 10-15 min to let them marinate. (Use this time to work on the rosemary fries). Heat a large pan (big enough to fit in both mushroom caps) over medium heat. Add 2-3 Tbsp of water, soy sauce and rosemary. Once this mixture gets bubbly, place both mushrooms into the pan GILL SIDE DOWN, and cover the pan. Cook for 3-4 min, flip the mushrooms and cook 3-4 min longer, or until the mushrooms soften and reduce in size. Slice the buns and toast them. Place the cooked Portobello caps on the bottom half of each bun. Spread a generous amount of the remaining barbecue sauce on top of each mushroom. 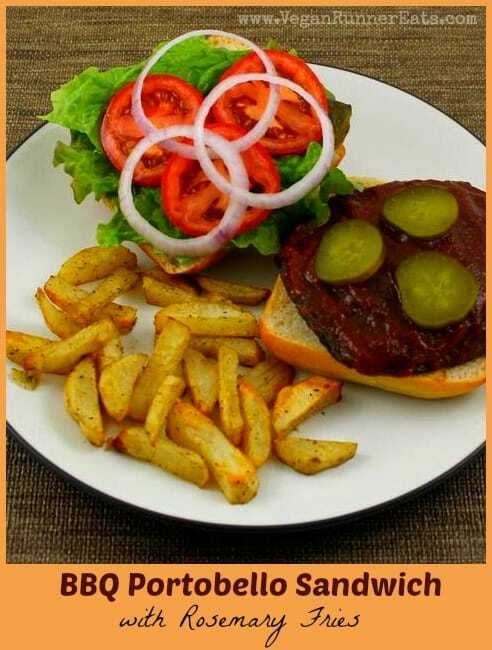 Place your favorite toppings on the top part of the bun, and close the sandwich. Serve with rosemary fries for the full experience! Wash and peel your potatoes (peeling is optional). Cut each potato into French fry wedges. Rinse the wedges with water, and dry with paper towels – this removes the extra starch. Place dried potato wedges on a cookie sheet, sprinkle with spices and salt. Using two spatulas, toss the potatoes to distribute the seasoning. Spray the wedges lightly with cooking spray, toss them again, and spray one more time. Place the potatoes into the preheated oven and roast for 15 minutes. Toss them again, and cook for additional 10-15 minutes, or until the wedges reach a nice golden color, and can be split easily with a fork. 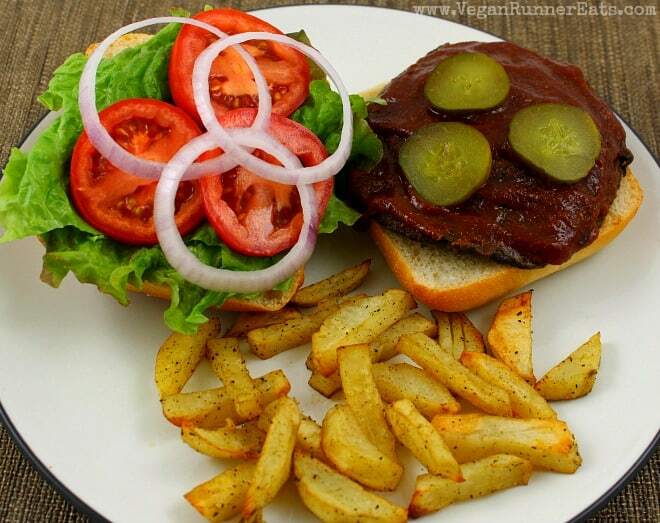 Serve with the BBQ Portobello sandwiches, or as a side for any of your favorite dishes! Question for you: What’s your favorite plant-based/vegan sandwich? This recipe is featured at the Virtual Vegan Linky Potluck #16 over here. Want to see more easy vegan recipes like this? Stay in touch with Vegan Runner Eats by subscribing in the top right corner of this post, or by following my blog on Facebook, Twitter, Google+ and Instagram! Tagged BBQ, comfort foods, cooking tips, easy recipes, mushrooms, potatoes, sandwiches, vegan dinner, vegan lunch. Bookmark the permalink.